Emory’s Surplus Property room is a bargain-hunter’s paradise with a serious sustainability mission: to prevent campus discards from ending up in area landfills. Milton Thomas and James Harper keep customers coming back with their signature mix of good humor and great service. Hours of operation: As of March 2, Monday, Wednesday and Friday 10 a.m. - 2 p.m. Reflecting on the steady stream of discarded items that have flowed through the doors of Emory's Surplus Property room over the years, the full suit of Medieval-style armor probably wins the prize for most peculiar. "Don't get me wrong, it was nice, a really nice suit of armor," recalls Milton Thomas, supervisor of staging and surplus property for Emory's Facilities Management division. "And it was in great shape — a real conversation piece," notes James Harper, administrative assistant for Facilities Management Auxiliary Services, which encompasses recycling and surplus. "Of course, it didn't last long," Thomas adds. "It sold pretty fast…"
When it comes to unusual campus cast-offs, there have certainly been other strong contenders. Consider the full-sized commercial salad bar, which an Emory professor eventually turned into an egg hatchery. Also in the running: a magnificent full-sized bar, a herd of rolling hospital IV poles, or even the occasional piano. For Thomas and Harper, trying to guess what might show up next — be it curious, practical, or even elegant — is a fun fringe benefit to the job. But beneath it all, they both take satisfaction in knowing the work is really about something bigger. Tucked away in a quiet corner of Building B on Emory's Briarcliff Property, the Surplus Property room is a bargain-hunter's paradise with a serious sustainability mission: diverting campus cast-offs from the local landfill by finding new homes for a never-ending assortment of retired Emory property. For a university the size of Emory, discards can add up. So the Surplus Property program steps in to play a unique role: picking up large furniture and equipment with life left in it, and selling it back to the Emory community at a steep discount. When it comes to reducing Emory's campus-wide waste stream, it's making a difference. Last year alone, the program diverted 345.48 tons of surplus furniture from local landfills, according to Deena Keeler, Emory's assistant director of Auxiliary Services. And increasingly, it's a program growing in new directions, partnering with campus student groups to explore new trends in upcycling and repurposing surplus items, as well as helping low-income students. Managing the retrieval and sale of surplus property — primarily office furniture, chairs, filing cabinets, lab and maintenance equipment, and assorted electronics — from across Emory's hospitals and campuses is a big job. But for the men who have become the program's public face, it's been enormously rewarding. 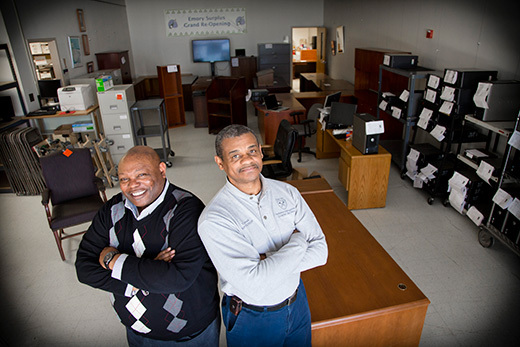 The Surplus Property program, which has been in place at Emory since 1985, has not only supported Emory's sustainability vision by keeping tons of serviceable furniture and equipment out of landfills. It's also created happy customers, actively aiding those in the campus community and beyond, including churches, small businesses and community non-profits with Emory connections. "It's a win-win for everybody," says Thomas. "We'll see a lot of nice, functional property come through and offer it back to the Emory community at a price that doesn't knock you off your feet." Bargains can routinely be found in office and waiting room chairs, small sofas, tables and hutches, bookcases and filing cabinets, and a virtual ocean of desks. And occasionally, when inventory is running especially high, they'll throw a sale, offering almost everything for $5. Although computers have proven a strong draw over the years, cyber-security concerns will be taking the program out of the computer resale business. Campus computers will soon be collected and "scrubbed down" by a third-party vendor, Keeler confirms. For many customers, the Surplus Property room offers a seedbed for creativity. Harper eagerly shares "before-and-after" photos of property that has found new life as reupholstered, repainted or repurposed furniture. That "up-cycle potential" is something that will be promoted in the coming year, he says. New merchandise arrives daily, and for convenience, Emory customers can preview inventory online or follow the Surplus Property Facebook page — which includes testimonial videos from happy buyers praising not just the great deals, but also the help provided by Thomas and Harper. As an added service, customers can also sign up on an e-surplus "wish list" to be notified if a sought-after item arrives. Another new service: Office administrators can not only call to arrange pick up for discarded office furnishings, they can also find help furnishing office spaces. A "quasi-interior design service" will provide computer mock-ups of potential office layouts furnished using surplus inventory on hand. At its core, Thomas and Harper say that the surplus property business is a "people" business. They've enjoyed getting to know repeat customers and working with local organizations that arrive through Emory connections, including area churches and community non-profits. "We recently worked with a group called MedShare, a nonprofit that donates medical equipment to underserved hospitals all over the world — including places where a waiting room chair could make the difference between patients sitting comfortably or sitting on the floor," Harper say. "We were able to donate seven hospital beds and a ton of waiting room chairs, which will hopefully help some people out," he adds. While they see plenty of staff and faculty, Thomas says the program is striving to increase visibility among Emory students. "We're actively working with the campus groups and sustainability reps in residence halls," adds Keeler, who describes how members of a graduate sustainability group last year turned a large lateral file cabinet into a metal planter, now on display near the Campus Services office. Beyond the daily bargains, there is something else that draws customers: Thomas and Harper share a fun-loving workplace chemistry — almost a trademark of the program — that customers have come to appreciate. From bringing in home-baked goods and sharing photos of refurbished treasures to the local pastor who dropped off a set of matching t-shirts that read "Straight Outta … Emory Surplus," their customers don't hesitate to return the love. "They are both long-time Emory employees who happen to love what they are doing," Keeler says. "Their commitment runs deep. They've made some strong relationships with the customers who come through, and the program has truly benefited from that."